ABS & ESP Traction Control technologies form the critical elements of dynamic stability control systems on modern vehicles. ABS/ESP Traction Control Systems is a one day technical course aimed at vehicle mechanics, technicians and apprentices. During the course, you will learn about the theory, functions and operation of ABS/ESP systems. You will learn about the various other sub-functions of modern vehicle traction control systems. The course explains ABS/ESP system components and how they work. You will learn how to test the ABS/ESP system and components using scan tool, oscilloscope and multi meter in conjunction with available wiring diagrams and technical information from Autodata. The course comprises classroom based technical sessions supported by workshop based practical sessions on live, road-going vehicles. ABS has been mandatory for new vehicles sold in the EU since 01st July 2004. Since 2012, ABS/ESP traction control systems have been further enhanced. The course also covers autonomous braking, adaptive cruise control and takes a look at how ABS/ESP systems have played a major role in the functionality of the various driver assistance systems found on modern vehicles. 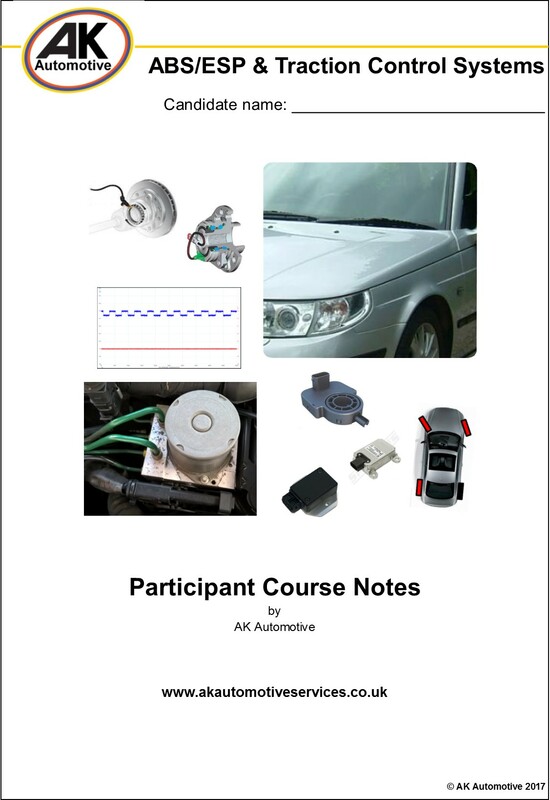 By the end of the course, you will have gained a working knowledge of ABS/ESP programmes fitted on modern vehicles. You will be able to explain how the system components work, and how to test and diagnose faults effectively using diagnostic tools and technical information. At the end of the course you will receive a Certificate of Professional Development from AK Automotive in recognition of your attendance on the ABS/ESP Traction Control Systems training course. Those wishing to attend this course should have a motor industry or other relevant technical background (emergency services and ex-military – R.E.M.E. welcome). To book a place on the next available ABS/ESP course, please contact Tony Kitchen at AK Automotive directly.